These easy Veggie Sheet Pan Nachos are loaded with all of your favorite veggies! 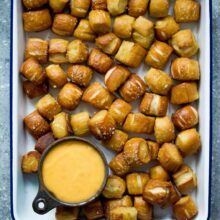 They are perfect for parties, game day, or every day snacking. Happy Cinco de Mayo! We are celebrating with my all-time favorite nachos, Veggie Sheet Pan Nachos. I LOVE nachos, especially when they are topped with lots of veggies. It makes me feel better about eating the whole pan..ha! Sheet pan nachos are the best because they are perfect for parties, game day, lazy days…pretty much every day. The are especially perfect for today because it is Cinco de Mayo and it is our duty to eat ALL the nachos. To make the nachos, dump out a bunch of tortilla chips on a large sheet pan. I like to use Kroger’s Private Selection Really Seedy Multigrain Tortilla Chips or Blue Corn Tortilla Chips, but you can use your favorite tortilla chips. Next, load the nachos with lots of cheese, black beans, and the peppers. 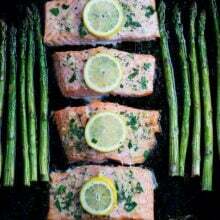 Pop them into the oven and bake until the cheese melts. When the nachos come out of the oven, it is time to top them with veggies galore! I don’t hold back, the more veggies, the better! The boys call these “salad” nachos or “mommy” nachos. They might make fun of me but they always help me eat them. They love them just as much as I do. Sometimes, I have to fight to get my fair share. The story of my life…living with boys is not always easy..ha! 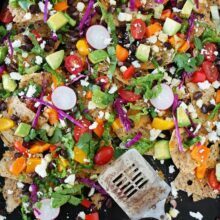 All of the veggies make the nachos bright, colorful, and pretty! Plus, they are super delicious. Sometimes, we eat the nachos for dinner and I don’t even feel guilty. Look at all of those veggies, my boys are right, the sheet pan is basically one giant salad! 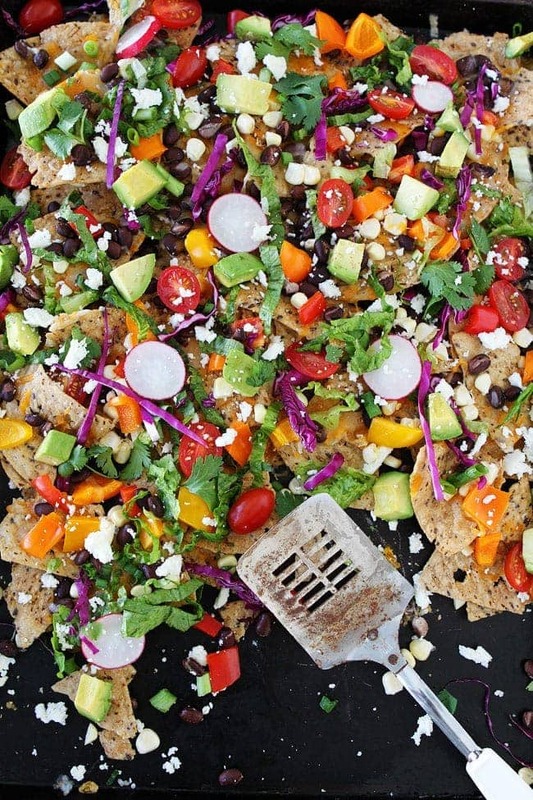 Celebrate Cinco de Mayo with Veggie Sheet Pan Nachos! And if you need other Cinco de Mayo recipes, find all of our favorites here. Have fun!! 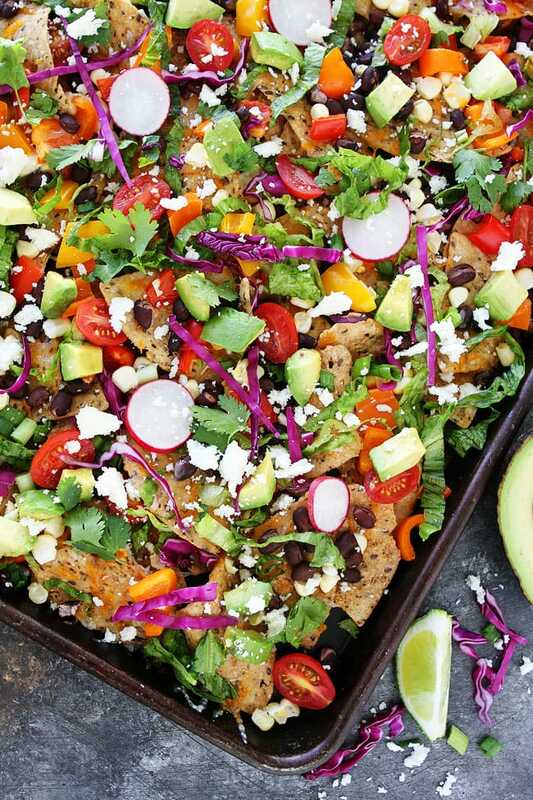 These easy sheet pan nachos are loaded with all of your favorite veggies! 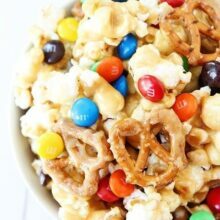 They are the perfect party food or snack! 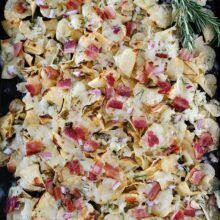 Place the tortilla chips evenly on a large sheet pan, making sure the entire pan is covered with chips. Top the chips with shredded cheese, black beans, and diced peppers. Place the nachos in the oven and bake until the cheese is melted, about 7-10 minutes. While the nachos are in the oven, make sure you have all of your veggie toppings ready to go. Remove the nachos from the oven and top with tomatoes, corn, lettuce, cabbage, avocado, radishes, green onion, cilantro, and queso fresco. Serve immediately. Such a fresh and healthy nacho! Whoa! This looks amazing! 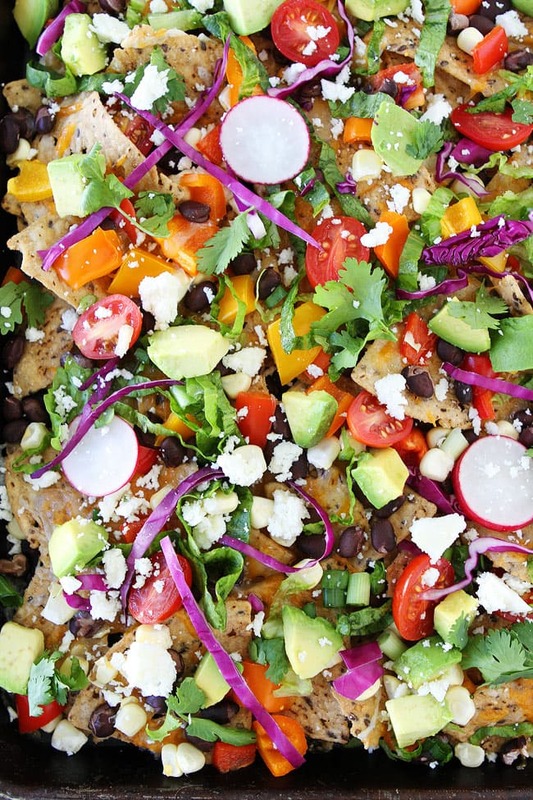 Love the whole one -pan deal but better yet …these nachos are so much lighter and healthier than usual. And the variety and freshness of the toppings make such a beautiful presentation. Nicely done! hey girl- these nachos look so yummy! Y’all have a great weekend! I don’t normally think of nachos as ‘healthy’, but I think I would put these in that category. Which is great news, because nachos are life. These are right up my alley! I LOVE all the veggies!! 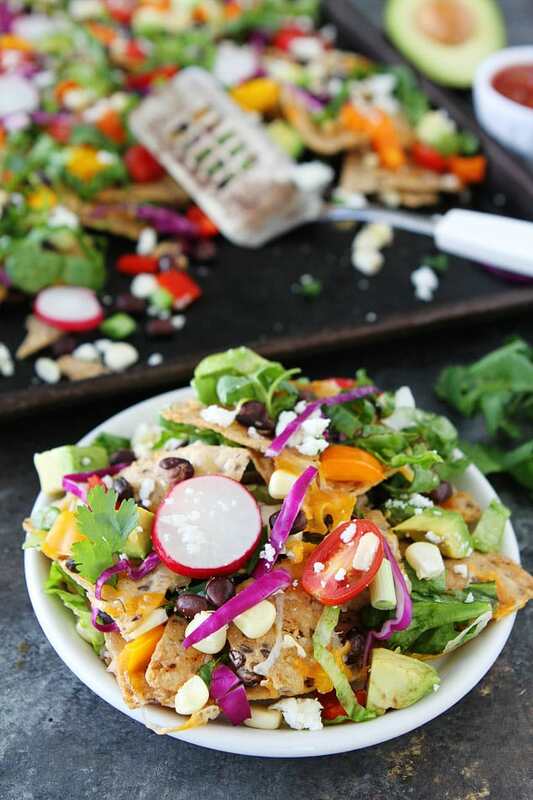 These nachos are so overflowing with goodness I almost want to call them healthy! 😉 Totally inspired to make some now. HA! Ha! Won’t have to feel guilty anymore when eating nachos… lovely plate, always very inspiring recipes! I am so going to try both the Zucchini boats and the nachos. My friend has a garden every year and he grows most of the veggies in these recipes. They look so appetizing.